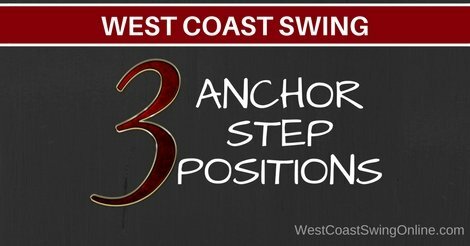 There are 3 basic anchor step positions that are commonly used in West Coast Swing. You can choose to end straight toward your partner, rotate open to your partner or rotate closed to your partner. In this post, you’ll get to practice anchors that rotate into the connection. Consequently, you can choose an anchor that fits any pattern for you and your dancing. We also include 2 other anchor step styling options! When going into an anchor, you can step straight, rotate open, or rotate closed. Both leaders and followers rotate closed on a left side tuck turn. On 4, the leader is rotating towards his connected arm as he steps back into the slot for the anchor. At the same time, the follower is turning towards the connected arm as she finishes their outside turn on 4 and anchor. All left side moves are closed rotating patterns for the leader; For example: a basic left side pass, left side inside roll, left side tuck turn, etc. For followers, closed rotating patterns come from outside turns: side tuck, sugar tuck, whip with a double outside turn, and barrel rolls. Because closed rotating patterns create a momentum into the connected side, anchor variations that take advantage of that momentum work really well. A simple example is a ronde. On a left side tuck turn, both the leader’s and follower’s bodies are prepped for a ronde through the anchor. For the leader, the step on 4 establishes the supporting leg, and the right leg can sweep counterclockwise, finishing with the right leg crossing in front of the supporting leg and then taking weight on count 6. The follower steps on count 4 on the right leg, then sweeps the left leg clockwise to finish the anchor. The finish position for the follower has the left leg crossed in front of the right leg, and the left foot takes weight in the crossed position on count 6. Although we’ve discussed 3 anchor step positions, the focus of this drill is to execute a closed-rotating anchor variation on closed rotating patterns. We still would recommend using normal anchors on the other types of patterns. Practice dancing to a song and use a closed rotating anchor variation on the appropriate patterns. At first, simply use the ronde variation described above. As you develop your skills, you can practice mixing all 3 anchor step positions that rotate into your arm! Try the side and cross anchors, body rolls into your arm, or many other options. Be creative! The key is to find a motion that makes sense with the momentum of the pattern.